Much to the disappointment of millions of women the world over, Paul McCartney married Linda Eastman on March 12, 1969. Although John and Paul were fairly estranged by this point, both as Beatles and as writing partners, the former best mates still seemingly must have felt a twinge of sibling rivalry- the same rivalry that had contributed so greatly to their success as the greatest song writing team in the history of popular music. You see, after seeing his buddy Paul tying the knot with Linda, John, quite suddenly, formally wed his greatest love, the Japanese avant-garde artist Yoko Ono. John asked his chauffeur, Les Anthony, to check and see if an immediate marriage at sea was possible. When Les told him no, John asked about a quick wedding in Paris. Also denied this possibility on such short notice, John, chomping at the bit, was happily informed that a quick wedding in Gibraltar was possible, as Gibraltar was a British protectorate and John was, of course, a British citizen. Thus it was that John and Yoko were wed in Gibraltar on March 20, 1969. After their rushed wedding, John and Yoko went on one of the strangest honeymoons in history- flying immediately to Amsterdam and bedding up together at the Amsterdam Hilton. It was to be a “bed-in” for peace with the unusual couple sitting in bed for a week, taking calls, meeting visitors, singing, eating and answering questions from a curious and bemused press. Fast-forward to a few weeks later on April 14, 1969. The ever-impulsive John Lennon had just written a song chronicling his and Yoko’s bizarre marriage and honeymoon and he had a burning desire to record it. There were just two hitches, and their names were George and Ringo. Although the two had been squabbling and backbiting with each other (as well as George and Ringo) over music, legal issues, financial decisions and, of course, the ever-present Yoko Ono, John unhesitatingly went back to his former friend, showing up at his door step and asking Paul to come to Abbey Road Studios, sans George and Ringo, and help him record his new song, titled “The Ballad of John and Yoko“. John played lead guitar, acoustic guitar and some percussion at the session. The versatile Paul took over on Ringo’s drums, as well as played bass, plus piano and the maracas. As for the vocals, John sang lead, with Paul occasionally chiming in throughout the song in harmony. Beyond it being one of the last happy days the pair spent together, it was also a historic occasion- the only time in the checkered history of the Beatles that John and Paul had recorded an entire song without the help or presence of George and Ringo. “The Ballad of John and Yoko” was a great success when it was released in the U.K. on May 30, 1969. It hit #1 on the charts, becoming the Beatles’ 17th and final #1 record in their home country. 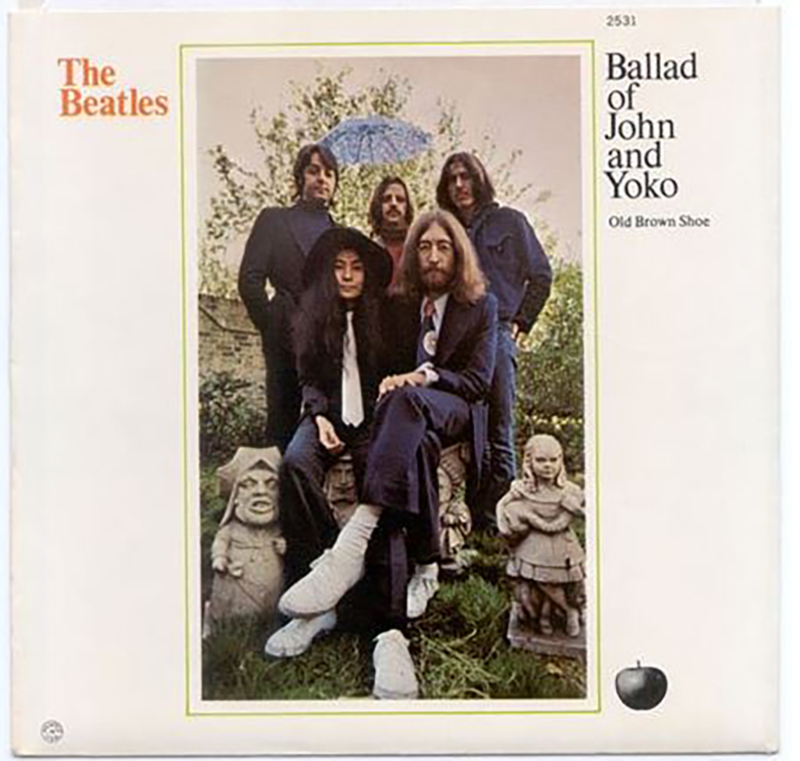 While recording “The Ballad of John and Yoko” was by all reports a joyous, fun day for the pair, the cover of the record was telling of the overall state of things with the Beatles. 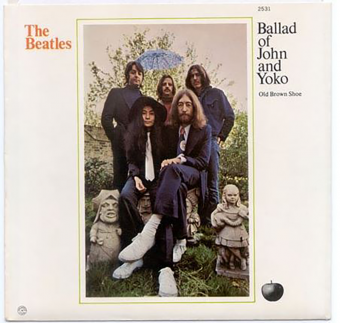 It features John and Yoko scowling seriously at the camera, as the other three Beatles stand behind them, clearly in the background and seemingly unenthusiastic about the whole thing.